Courtyard Farm aims to combine profitable farming with providing an environment where native wildlife can thrive, and public access is encouraged. For wildlife, this means building up a healthy, living soil to benefit insects and native plants which, in turn, attracts birds and mammals. With an organic system, it is possible to marry the farm's objectives of providing crops and meat for food without artificial pesticides or fertilisers, while providing an ideal habitat for wildlife. The farm is also an enjoyable, and safe, place to visit. The farm finished converting to organic in 2000, and meets the highest, Soil Association organic standards. Peter Melchett, a director of the farm, is well-known for his environmental campaigning work at Greenpeace in the 1980s and 90s, and is currently Policy Director for the Soil Association, the main UK organic body. Organic farms also employ more people than intensive farms (in Eastern England, for non-organic farms this can mean less than one farm worker per 1,000 acres). Courtyard Farm employs one full-time working farm manager, Jay Mond Wedd, and with regular part-time workers this provides the equivalent of two full -time jobs, on 890 acres. In addition, the pig enterprise has three full-time workers plus some temporary help. The Organic Pig Company is rearing piglets at Courtyard, for Waitrose organic pork. 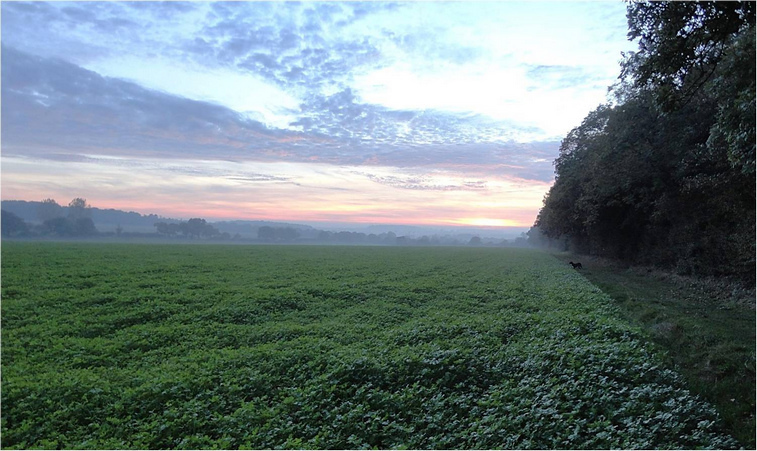 The 750 sows and their young use around 35 hectares (90 acres) of clover fields, moving on to fresh fields after one year. Once they are weaned, the piglets move to a nearby organic farm for finishing. Organic sows make a straw nest where they give birth, and organic pigs are always free range, fed organic (and non-GM) diets, and are free to root in the rich earth for insects and roots. Wintering birds, including starlings, jackdaws, gulls and wagtails appreciate the extra food. The pigs add vital nutrients (Phosphate and Potassium) for the following crops, to add to the Nitrogen fixed by the clover. In some years, cattle from a nearby organic farm spend the summer months grazing on the wild flower meadows and clover fields at the farm, and other cattle use the farm's grazing marshes at Holme, and spend the Winter in our cattle building. Organic animals stay with their mothers longer than non-organic (whether 'outdoor', 'free-range' or intensive). Organic animals grow more slowly, eat natural diets, can always move around freely, and live in settled family groups to minimise stress. 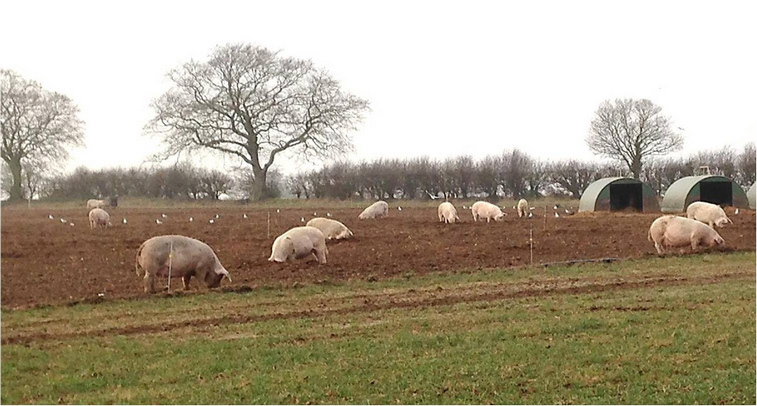 For most of the year, the pigs and any cattle can be seen from the public footpaths on the farm. Please do not approach the pigs, and never feed them; make sure dogs stay strictly on the footpaths, and on leads if cattle are in a field crossed by a path. Wheat, barley (above), beans and peas, and red clover are the main crops grown in the six-year rotation at Courtyard Farm. 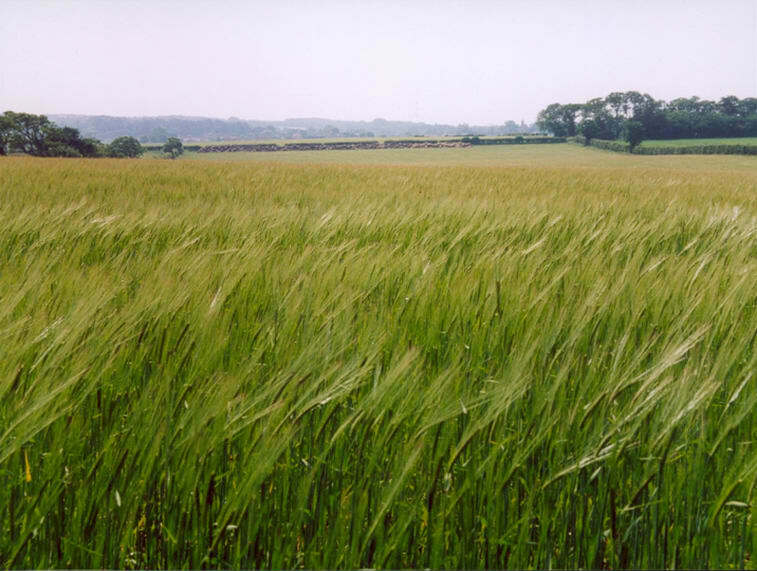 The wheat, barley, peas and beans are grown for use as seed by other organic farmers, demanding very clean fields and high quality grain. The peas and beans are then used for animal feed, the wheat for animal feed or milling for bread and biscuits, and the barley for animal feed or malting for beer. Clover is essential in an organic system for putting nutrients back into the soil without using artificial Nitrogen fertilisers, made from fossil fuels. The energy from sunlight allows clovers (and crops like peas and beans, also grown at Courtyard) to fix Nitrogen in their roots, which is vital for growing crops. After growing under a wheat crop for one year, the clover remains undisturbed for two more years, to maximise Nitrogen fixing. The clover fields are cut for silage (to feed the cattle in winter), sometimes grazed by young cattle in summer, and have pigs on them for the final year. Manure from the cattle also adds some fertility to the soil, mainly in form of Phosphorus and Potassium, the other two elements vital for growing crops. Over the Winter, we grow a cover crop, usually mustard (below) or vetch, to prevent any soil erosion and to hold the nutrients for the next crop, planted in the Spring.